Pharmaceutical Science Book from C.H.I.P.S. 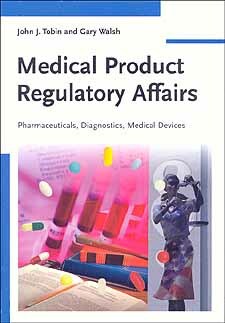 Written in a clear and concise by experienced authors, Medical Product Regulatory Affairs covers regulatory affairs in all major global markets for pharmaceuticals and medical devices. Following a look at drug development, complete sections are devoted to national and EU regulatory issues, manufacturing license application and retention, and regulation in the USA. Other topics dealt with include CDER, CBER and marketing and manufacturing licenses, the ICH process and Good Laboratory/Clinical/Manufacturing Practices. Medical Product Regulatory Affairs covers everything pharmacologists, bioengineers, pharma engineers, students in pharmacy and those working in the pharmaceutical industry need to know about medical regulatory affairs.